While we here in New York talk about really important stuff, our peers in Tokyo are having an interesting, and elevated, debate about preservation on Omotedando. The editor of Tokyo's Metropolis told us how he really feels, while iMomus contributes a much more nuanced piece on the matter. 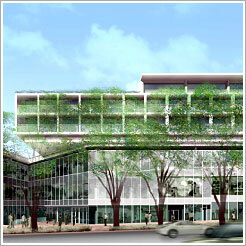 Omotesando Hills is another of Minuro Mori's Developments designed, of course, by Tadao Ando. The building is not yet completed. It was a hole in the ground a year ago, when I was there.